My dear vegetarian friends, I heard ya! This one is for you so please, keep reading. Love me some Taco Tuesday’s! Who doesn’t love a good Taco Tuesday? It’s an after work indulgence. It’s a social rite of passage. It’s cheap eats, and who doesn’t like that? It’s just fun, tasty and all of the above. This history of Taco Tuesdays is a bit sketchy and two separate Mexican food establishments (from California and Wyoming) have laid claim to its creation. But the bottom line is it began as a low cost promotion to bring in customers on a night that typically had low attendance, while exposing patrons to the array of menu offerings and events the restaurants had to offer. Most Taco Tuesday’s are often more than just tacos. Many feature a tapas or small bites menu. The mash ups, iterations and combinations range from predictable to delectable and wildly innovative. As an homage to my love of all things Taco Tuesday’s and with an ear to the hue and cry of my vegetarian friends and followers, I created a wildly innovative mash up I hope will take your tapas to new heights. It’s a tostada. Not just any tostada, but one that has soul, character and hint of sassiness. 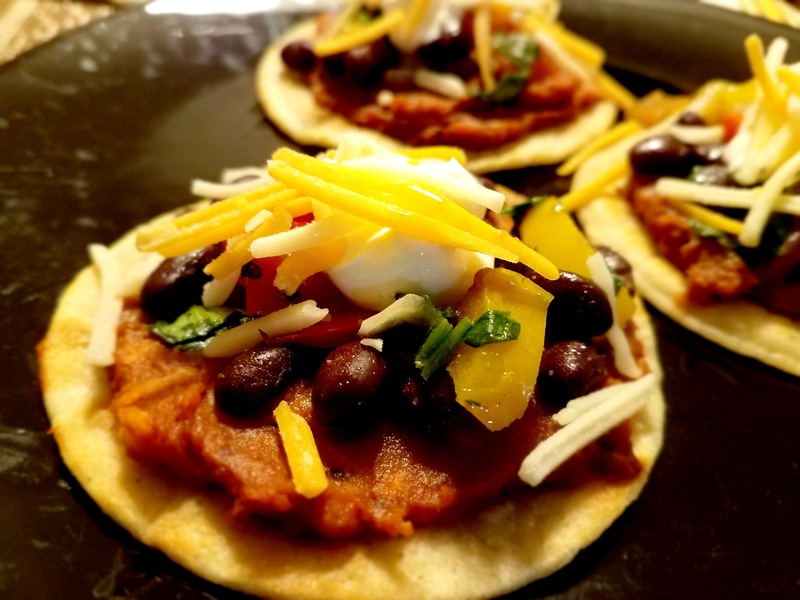 My Sweet Potato and Ancho Chile Tostada with Black Bean Salsa is a bit of a departure from the expected, but it is unexpectedly good. The mild heat and fruity flavor of the ancho chile paste perfectly complements the slightly sweet, earthy notes of the sweet potato. The addition of fresh thyme to the mixture gives it warmth and depth. The flavor is delicate yet elevated and the mixture is a great alternative to classic refried beans. 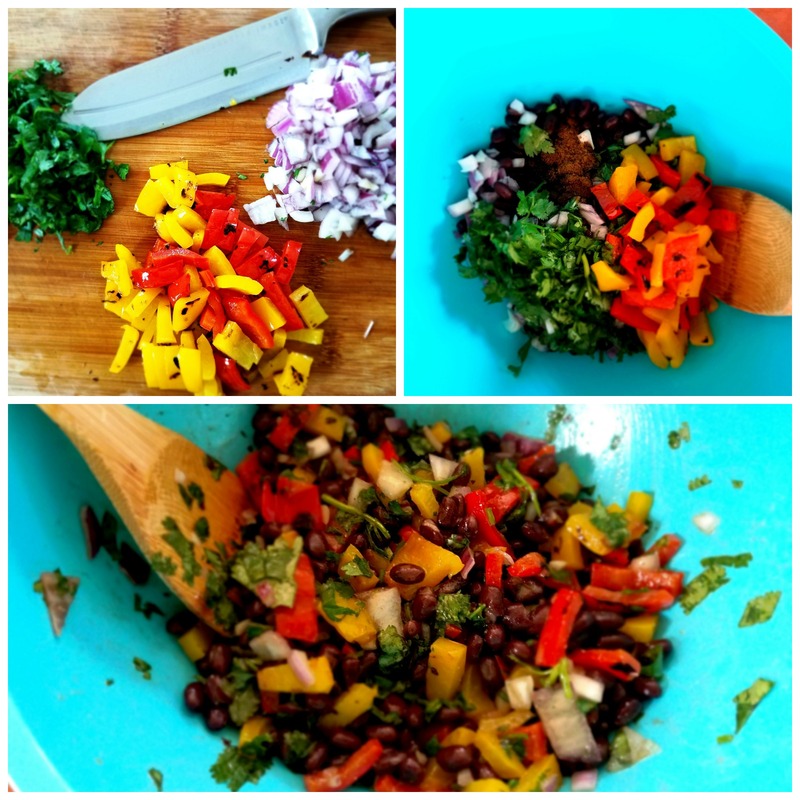 Oh and let’s not forget about that black bean salsa that tops this tasty tostada which is both savory and sassy. 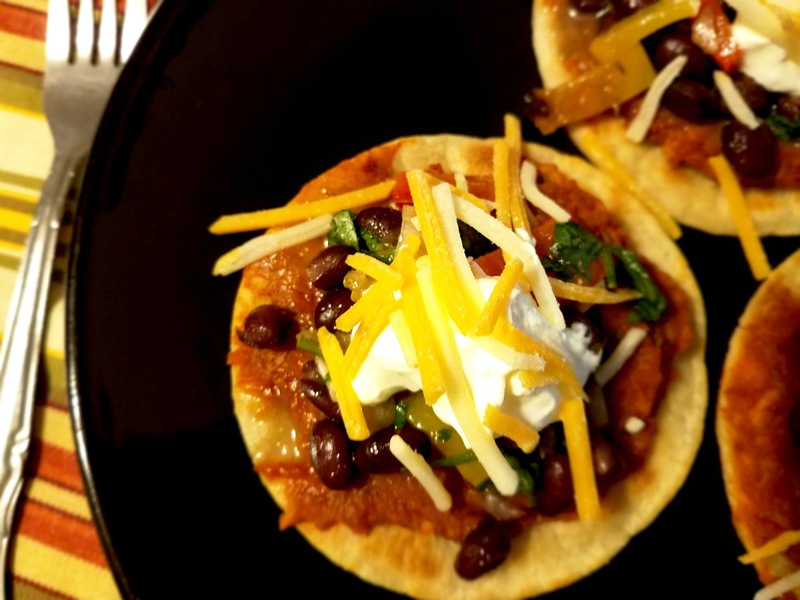 One last thing, for this recipe, I used taqueria or mini size tortillas. This recipe serves four or even more so don’t dine alone. Don’t go out for Taco Tuesday, dine in. Thank you Goya Foods for providing a lot of the ingredients and the inspiration for this recipe. I hope you will be inspired to give it a try and turn up your Taco Tuesday or any day of the week. A departure from the expected, yet is unexpectedly good. 2. In medium bowl, stir together bell peppers (or tomatoes), black beans, tomato, onions, cilantro, Adobo Light, lemon juice and olive oil until well combined; cover with plastic wrap and set salsa in refrigerator until ready to serve. 3. Place chilies in medium bowl and cover with hot water. Let sit for about 15 minutes. 4. Meanwhile, pierce two medium sweet potatoes (total weight just over a pound) with a fork and place in microwave. Bake about 15 minutes until soft. When done, remove skin and place flesh of sweet potato in a mixing box. 5. After 15 minutes, remove stems and seeds from chilies and transfer them and 3 tablespoons soaking water to a blender. Add lemon juice, 2 tablespoons vegetable oil, Adobo, cumin, garlic and thyme to a blender. Blend on high speed until smooth, about 1 minute. 6. 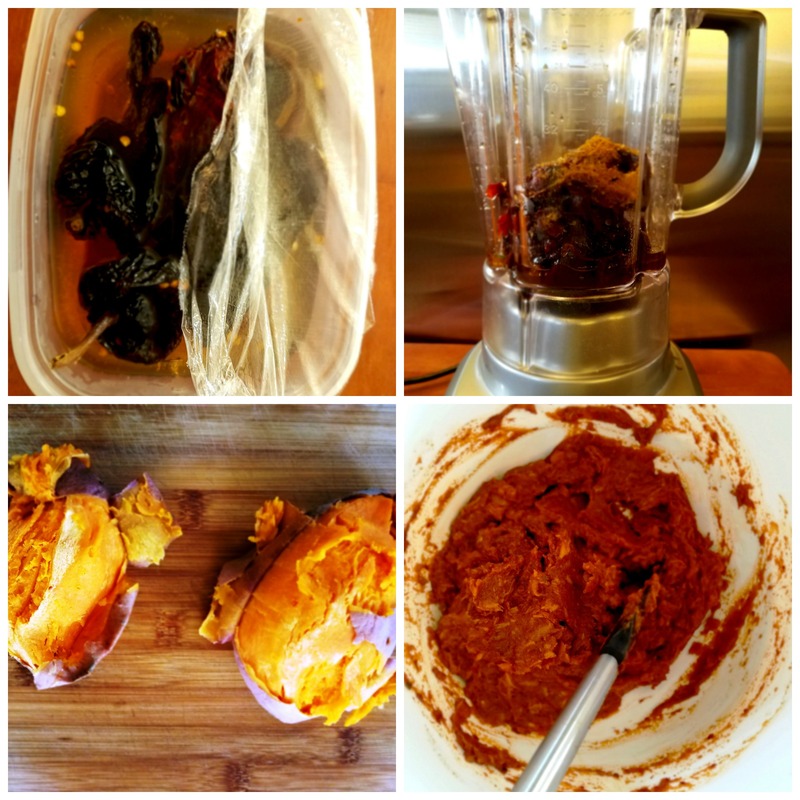 Add ancho chile paste and sweet potatoes to a bowl and mix well. Place mixture into a ceramic dish, cover with foil and keep warm in oven. 7. Heat about a tablespoon of corn oil in a large skillet over medium-high heat. Once oil is hot, but not smoking, add two large corn tortillas or three taqueria or mini size tortillas to skillet. Fry, flipping once, until tortillas are golden brown and crisp, about 1 minute per side; transfer to paper towel-lined tray to drain. Add more oil as needed and repeat with remaining tortillas. 8. To assemble tostadas, spread a heaping spoonful of the warmed sweet potato and ancho chile filling on each fried tortilla. Spoon black bean salsa on each tortilla and top with sour cream if you like, and your favorite grated cheese. Note: You can also add sliced avocado, chopped rotisserie chicken or another other protein before you add the bean salsa for those who just have to have meat or seafood. Left: bell peppers cut, seeded and sliced for grilling. 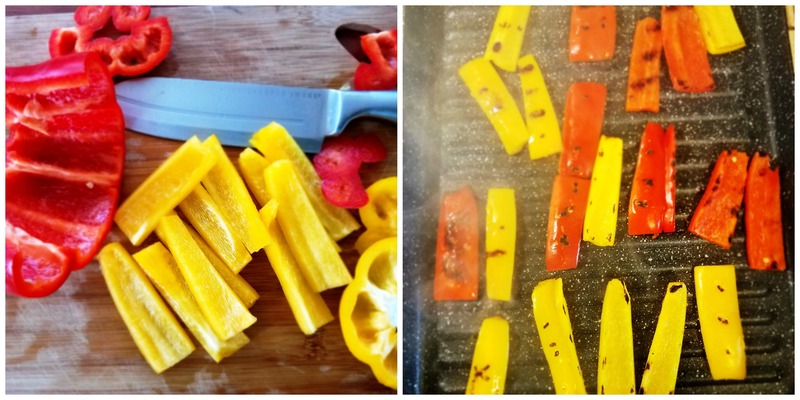 Right: bell peppers cooking on stove top grill pan. Top left: Cut bell pepper, chopped onions and cilantro. To right: chopped ingredients added to mixing bowl with drained and rinsed black beans, Adobo Light All-Purpose Seasoning with Pepper, lemon juice, and olive oil. Bottom: ingredient’s mixed and ready to be covered with plastic wrap and placed in the fridge. Top left: ancho chilies soaking in hot water, covered. Top right: chilies added to blender with hot soaking water, lemon juice, vegetable oil, Adobo Light All-Purpose Seasoning with Pepper, cumin, garlic and chopped fresh thyme. Bottom left: microwave baked sweet potatoes. Bottom right: blended ancho chile paste and baked sweet potato mixture. 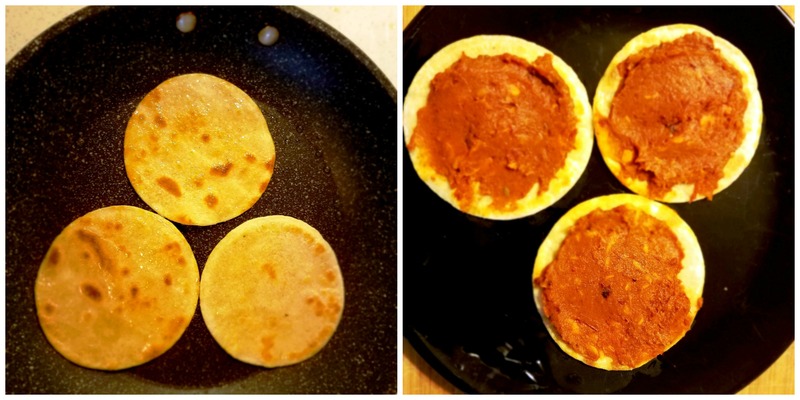 Left: Taqueria size tortillas frying in a large skillet. Right: a heaping spoonful of the warmed sweet potato and ancho chile filling on fried tortillas. Up close and personal view of Sweet Potato and Ancho Chile Tostadas with Black Bean Salsa. ¡Delicioso! This entry was posted in Foodies and tagged ancho, ancho chile, betterforyou, Black Beans GOYA® Adobo Light All-Purpose Seasoning with Peppe, GOYA Foods, goyafoods, goyagood, Mexican food, r taqueria tortillas, salsa, sweet potato, Taco Tuesday, Taco Tuesday’s, tortillas, vegetarian tacos. Bookmark the permalink.